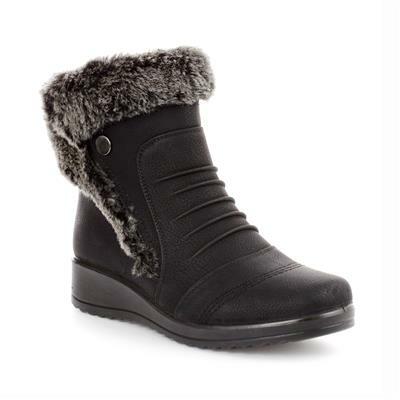 Treat your feet to ultimate comfort and warmth during the upcoming colder months with a pair of these super cosy womens black faux fur trim ankle boots by Softlites. They showcase a round toe, zip fastening, faux fur trim around the ankle, silver stud details, a small wedge and a gripped outer sole. Buy and stock up on your winter essentials today and with our free standard delivery, we can ensure they'll be with you in no time! Lovely boots but very disappointed with the fit.i'my a size 8 footwear but with yours I have to have size 9. Wore boot in a covering of snow and my toes were nice and toasty. would def recommend this boot for the snowy weather walking. Really comfy and stylish they look nice on and it's like walking on air I definitely recommend these boots.